Disclaimer: Romy is my brother-in-law. The Kashrut Commission of Inquiry established by The New South Wales Jewish Board of Deputies has released its recommendations. The market for kosher products and services in NSW should be as open and competitive as possible so as to facilitate the reduction of costs for consumers. • Urgent structural reforms in relation to the provision of kashrut certification in NSW should be made. • The certifying kashrut authority should be transparent, representative of the Community, and run as a not-for-profit operation, with a recognised set of governance rules consistent with community norms. • Community funds should be made available to seed and/or support such a kashrut authority. and the permissibility of meat products from inter-state certified providers to licenced Kosher Establishments in NSW. member of the JBD Executive and two being members of the KCI, to supervise the implementation of these recommendations as far as possible. • Bruce Fink, member (representing the UIA). • Romy Leibler, member (representing the COSA). • Geoffrey H Levy, AO, member. • Yair Miller, member (representing the JBD). • Peter Philippsohn, OAM, member (representing the JCA). Jeremy Spinak, president of The New South Wales Jewish Board of Deputies said: “The NSW Jewish Board of Deputies fully endorses the Commission’s recommendations and, in partnership with other community-minded organisations, we will strive to see that they are implemented. Kashrut is crucial to Jewish life and we strongly believe that the Commission’s recommendations, once implemented, will deliver the transparency, accountability and meaningful competition that the community demands. We specifically commend the Commission for recommending a number of cost-saving measures aimed at lowering the cost of keeping kosher in NSW. The recommendations are fundamentally concerned with Jewish continuity; we don’t want keeping kosher to be priced out of reach for Jewish families. The report clearly shows that reforms are needed. We believe delaying doing so any longer would be to disadvantage the observant members of our community and other consumers of kosher products. I look forward to working with our colleagues, including the Kashrut Authority, whose technical excellence in this area is unparalleled, in the spirit of Ahavat Israel to ensure that these important changes are implemented and that our model for kashrut arrangements becomes the best in the Jewish world. Finally, I would like to thank the Commissioners, in particular Chairman Robert Gavshon, for producing such a rigorous and thorough report and for the months of hard work and dedication that they expended on behalf of our community. The creation of the KCI was deeply rooted in the principle that the Community requires a range of kosher products and services (including catering and supervision services) at affordable prices, and requires delivery of these services in a transparent manner. Indeed, the sustainable, affordable and transparent provision of such products and services is a fundamental pillar of a strong Jewish community. As a result of the development of significant solvency issues of kosher caterer Passion8 in 2013, a group of philanthropists and JCA donors asked the JCA to assist with the conduct of a financial review of Passion8’s business with a view to salvaging the business. This was felt essential due to Passion8 playing a pivotal role in the provision of kosher catering to the Community. Following the completion of the review, Passion8 was placed into administration. In August 2013, during the review, the KA approached the JCA for financial support. It asked the JCA for a one-to-two year bridging loan in the approximate amount of $68,000, equivalent to the debt claimed to be owed to it by Passion8.1 It is not in the JCA’s charter to provide loans, nor to fund non-constituents, and the JCA could not therefore agree to provide such a loan or funding. Shortly after Passion8’s closure, a new caterer, AIT, was formed. AIT acquired some of the assets of Passion8 from its administrator, and it was granted a temporary licence by the KA. When the temporary licence expired in October 2013, after being on foot for three weeks, and after negotiations between AIT and the KA broke down, a number of communal organisations saw an impending crisis where no kosher caterer would be able to deliver the majority of the large functions in Sydney, particularly in the period from November 2013 to January 2014, when a communal function and many private functions were then due to take place. The JBD, supported by the JCA, started a mediation process between AIT and the KA in an attempt to avoid such a crisis. COSA was also involved in an attempt to mediate a solution. After operating for several weeks without a Hechsher from the KA, in late November 2013, AIT began to operate under kosher certification from Rabbi Yossef Feldman. Once it was made public that they had become involved in the discussions with the KA, the JBD and the JCA were approached by multiple stakeholders (including the UIA, the JNF and Kesser Torah College) to review the current state of kashrut in NSW. They began engaging with many industry participants, including the meat and poultry suppliers, Kosher Establishments, rabbis and other communal organisations. The JBD and the JCA did not succeed in getting the KA and AIT to agree on mutually acceptable terms to resolve their outstanding issues and withdrew from that process. Discussions with the KA, however, continued on the broader issues raised. In the course of the negotiations and mediation the JBD and the JCA recommended to the KA that it move to an independently appointed rabbinic board, and that it expand the lay membership of the KA board. The KA initially welcomed the concept of additional lay members. The JBD and the JCA recommended five shomer Shabbat candidates who they felt could add balance and significant expertise to the KA board. Only one of the candidates was deemed acceptable by the KA. 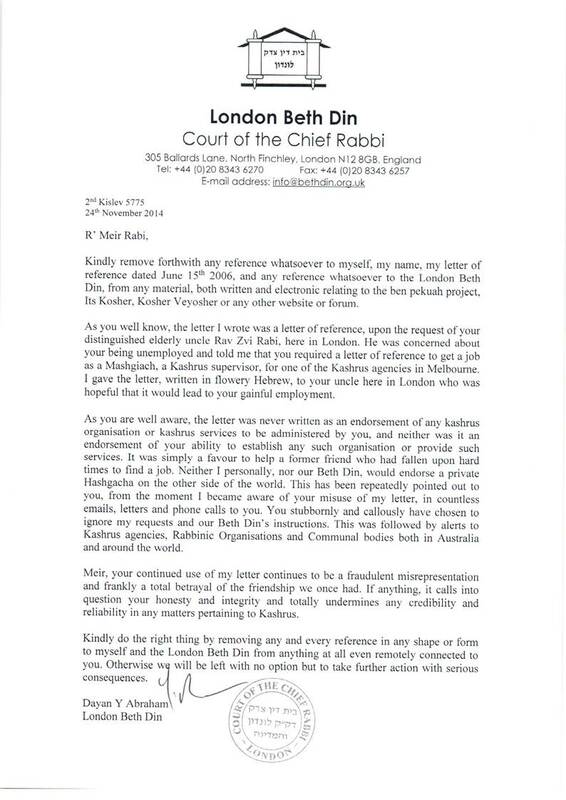 The KA made it clear that the structure and selection of the rabbinic leadership of the KA was an issue solely in the domain of the SBD and was not something that was open for discussion in any negotiations. This precluded the JBD and the JCA from taking this issue any further. In November 2013, the KA published a document online and in the Australian Jewish News referring to the JCA having viewed its accounts. After consideration, the then CEO and the President of the JCA felt that the document was potentially misleading as it implied that the JCA endorsed the accounts of the KA. The JCA suggested, and the KA agreed, that the KA participates in a forensic review of its accounts. The JCA Executive believed that this would be beneficial for community confidence in KA finances. Martin Bloom, former managing partner of Horwath NSW and then principal at Deloitte, was invited by the JBD and the JCA to conduct an independent review. Mr Bloom’s services were initially accepted by the KA. He had one meeting with the KA and other meetings with industry representatives. The KA declined Mr Bloom’s request for a subsequent meeting and asked that he be replaced by Peter Hersh, the KA’s own auditor. While not questioning Mr Hersh’s expertise, the Presidents of the JBD and the JCA came to the conclusion, after careful consideration and consultation, that it would not be appropriate for an independent review to be conducted by the KA’s own auditor. The KA withdrew any participation in the review and claimed that any use of the word ‘forensic’ had an implication of inappropriate behaviour. This issue had not previously been raised at any point in the previous months of discussion by the KA or their representatives. The JCA immediately agreed to drop the term “forensic” but recommended that the review should continue. The KA declined to agree. As a result of the KA’s refusal to agree to an independent review of its accounts, its refusal to accept the appointment of independent directors to the lay board as suggested by the JCA and JBD at that time, the Presidents of the JBD, the JCA, the UIA and the JNF came together and requested the JBD to establish the KCI. In January 2014 the KCI, was established by the JBD to examine kashrut in NSW on its behalf and to report back to the JBD with its findings and recommendations. The establishment of the KCI also followed discussions with, and had the imprimatur of, the COS, which is the roof body representing the majority (15) of orthodox synagogues in NSW. Will the board membership of any new lay Kashrut body be made up of individuals both women and men who are personally committed to Kashrut observance. At a time in the future a national kashrut authority will come into existence, similar to the OU in the US. The independent communities i.e. Adass in Melbourne with not join but all others will. The lay board members who will supervise the business affairs of such a body will need to be Shomer Shabbat and the Rabbonim will be appointed by the dint of their knowledge of Kashrut. The major issue facing kosher supply is the high cost to the consumer which has its genesis in the unfortunate fact that there is small percentage of households eating kosher, only,especially in Sydney. At this time the economies of scale just do not exist. A generational change will occur. such communities will stay independent of the”moderener” at any cost. people will buy their meat etc if it is of the highest quality. As determined business people they will not loose out. The Modern Orthodox and Chabad will work out a joint Hashgocho and that will represent the vast majority of Australian Kosher consumers. The small market will always be the enemy of lower costs except if the lay body will subsidize meat production in some form.